Police raided the Hemdat Yisrael synagogue in Istanbul on a recent Sabbath, demanding identification from worshipers, many of whom carried no identification because of the Sabbath restrictions. While those who did not have identification were able to present it at a police station after the Sabbath, it seems that this is not the only recent provocation against the Jewish community in Turkey. The Turkish Milliyet newspaper reported that the Muslim government in Turkey appears to be cracking down on non-Muslim minorities. The individual communities are not being permitted to have their own leaders; one person will be recognized by the government to represent all the minorities as one. As the Christian community outnumbers the Jewish one, it is expected that a Christian will serve as “Chief Rabbi.” This issue may have been resolved, however; see below. In addition, Christian and Jewish children are being placed in separate non-Muslim public school classes. In Jewish schools, only Turkish citizens are allowed to be registered – preventing the son of a Jewish United States consul worker from studying in a Jewish school. Leaders of several minority religious communities convened for an emergency meeting last month to discuss the worsening situation. Rabbi Yitzchak Haleva, Chief Rabbi of Turkey, says it’s “much ado about nothing.” Speaking with Israeli media sources last week, Rabbi Haleva said that all misunderstandings had been resolved and that he himself will be running for re-election for the position of Chief Rabbi about two months from now. Regarding the mid-services Sabbath check of ID’s, Rabbi Haleva told Makor Rishon’s Yitzchak Hildesheimer that it was only a matter having to do with internal security. Has anyone learned from the last time this happened? Turkey getting closer to Iran and acting to the orders of that "nutcase"! A Turkish "kristalnacht" to start killing Jews? Turkey is lost to Islamism. Shalom Carl, I myself born and raised in neighboring country of Azerbaijan. Thank G-D for now everything is fine there regarding local jewish community but I heard rumors that things might be changing for worse but I hope not. 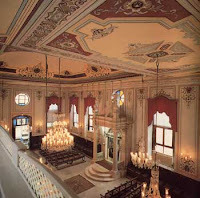 We have in Baku 3 major synagogues Juhuro (Gorskie), Ashkenazi and Buharkie. I am not sure if you heard in the past a few headlines from baku how terrorist were trying to blow up Israeli embassy but current government got them in time and they all in jail now. This is alarming to me what happening in Turkey, how come no other Israeli press like jpost.com, ynet, yeshanews.com did not report that news. Its very important news when something like this happens to local minority group that never tried undermined and cause any instability in the country.